I recently found a beef carnitas recipe and wanted to play around and tweak it. Because stew meat is tough, I braise the meaty chunks on 250 degrees F for four or five hours. The meat just falls apart when you do that and is really delicious! As some of you know, I am a homegrown Texas girl and decided to move to the pacific northwest almost 4 years ago. Time sure has flew by! One thing that I have had no luck with in this part of the country is finding the kind of Tex-Mex foods that I grew up with. I desperately miss Tex-Mex! Sometimes, I have to break down and just make a giant meal with tacos, rice and beans. Today is that day. 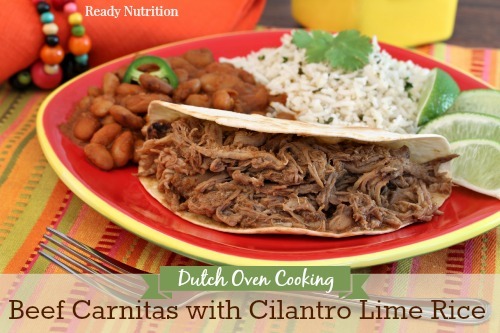 Ok, this isn’t your ordinary carnitas recipe. A lot of people use chuck roast for their carnitas, but I found some stew meat marked down and I couldn’t resist the deal, so I decided to try them out on a new recipe. I recently found a beef carnitas recipe and wanted to play around and tweak it. Because stew meat is tough, I braise the meaty chunks on 250 degrees F for four or five hours. The meat just falls apart when you do that and is really delicious! So, without further adieu, here’s a recipe to pay homage to all the great Tex-Mex in Texas. Oil a Dutch onion and place sliced onions on the bottom. Add meat add salt and pepper liberally. In a medium mixing bowl, add spices, peppers, broth and lemon juice. Mix well. Pour mixture over meat and onions. Cover with a lid and cook for 4-5 hours. When beef is done, it should easily shred apart. Serve with corn tortillas and your favorite taco toppings. Add rice and lime juice, stir for 1 minute. Add water and salt, bring to a full rolling boil. At boiling, cover, turn down to simmer over low heat until rice is tender and the water is absorbed, about 25 minutes. Fluff rice with a fork. So there you have it. A very simple yet tasty meal with minimal effort. Enjoy!